This lens enclosure protects a lens against dust and human tampering. It is compatible with most of our C-mount and CS-mount lenses. 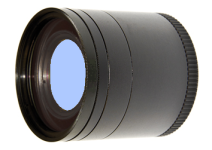 When combined with a C-mount lens and installed on a CS-mount camera, optical magnification will be as expected. For example, a 12 mm C-mount lens mounted inside this enclosure on a CS-mount camera will have magnification similar to a 12 mm CS-mount lens. When installed on a C-mount camera, the built-in 5 mm spacer ring will increase magnification and reduce the minimum object distance. In other words, you’ll want to mount your camera further from the object to be imaged to get the same results. Also available with acrylic window for FDA installations – see catalog number EEMS101. Accommodates a lens up to 42.5 mm in length and 37.5 mm in diameter including thumbscrews. Contact us for help assembling an enclosure for longer lenses.